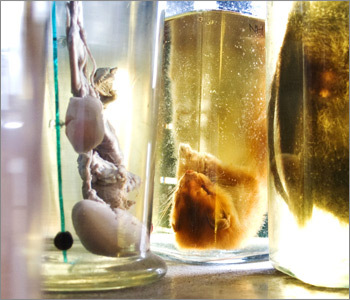 Fluid-preserved Natural Science specimens are housed in specialised storage conditions within many museums. Smaller museums often consider them too much of a health hazard and fire risk or are too understaffed to bother with them. Fluid-preserved collections require constant maintenance or they will rapidly deteriorate. Despite this, most specimens can be rescued from a semi- or nearly totally-deteriorated condition by a trained conservator. Fluid-preserved specimens are highly important since reference can be made to them at any time as new characteristics to species definition are constantly being discovered by taxonomists - this is particularly important where now-extinct species can still be examined. Molecular biologists store samples of animal and plant DNA in absolute ethanol as a reference collection since this will not interfere with the molecular structure of DNA. Most whole specimens are stored in 70-80% IMS (industrial methylated spirit) which dehydrates them and maintains their state of preservation so that they do not deteriorate. Such specimens are stored in glass jars in a cool temperature (about 10 degrees Centigrade) and in the dark. Provided that this state is maintained they can last indefinitely. Maintaining them can be a problem - formaldehyde which is used as a fixative (initial preserving agent) is poisonous and dermatitic, its fumes are highly irritating and carcinogenic; IMS is highly flammable. Small specimens are sometimes stored in preserving fluid inside glass cells as microscope mounts - these are sealed with gold size and stored in slide cabinets. Care and Conservation of Natural History Collections. Eds Carter DJ and Walker AK. Published by Butterworth-Heinemann, London, 1999. ISBN 0 7506 0961 3.